Offering over 7 million products and with everyday low prices, a wide variety of name brand products, and first-rate customer service, Rakuten.com Shopping is a leader among online shopping destinations. 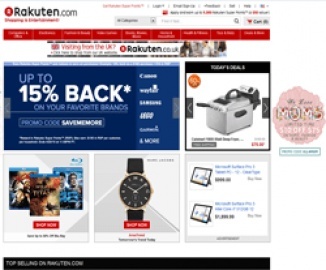 0% cash back for customers Rakuten.com Shopping identifies as resellers. 4% Cash Back on Automotive, Bags & Luggage, Beauty & Personal Care, Clothing & Shoes, Food & Beverage, Health, Everything Else, Home & Outdoor, Books & Media, Office Supplies, Pet Supplies, Sports & Fitness, Toys and Babies. 0.8% Cash Back on Computers, Consumer Electronics, Software and Video Games. 0% Cash Back on Gift Cards & Warranties. Click Start Shopping to earn 0.5% Cash Back at Rakuten.